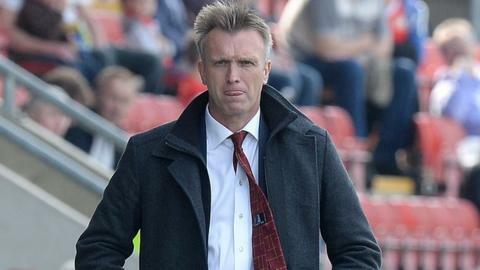 Crewe Alexandra manager Steve Davis admits that he did not think his team were going to stay up, following their final-day survival in League One. The Alex eventually secured safety with a 2-1 home win over promotion-chasing play-off contenders Preston North End. But Davis told BBC Radio Stoke: "We've managed to pull off something that I didn't think was possible. "We were almost always in the bottom five or six and that can can really wear you down." Because of the restrictions on finances, to be in a league like this is overachievement. Davis even suggests that staying up tops the achievement of the Alex's two moments of Wembley magic over the last two years - winning promotion via the League Two play-offs two seasons ago and then winning the Johnstone's Paint Trophy in 2013. "As far as maintaining our status in League One is concerned, that's way above winning the cup and winning promotion," he added. Crewe's campaign was disrupted right from the moment that Davis was linked early last summer with a move to hometown club Wolves. They then had the shock of seven players arrested in July, before all charges were dropped four months later, over an incident while at their pre-season training camp in Cornwall. And Davis lost striker Mathias Pogba, their 16-goal top scorer in 2012-13, with a knee injury that kept him out for half the season. On top of uncertainty over goalkeepers, with four of them being deployed over the campaign, they were also further derailed when Davis outlined incidents of player unrest. "Because of the start we had, we were always playing catch-up," he admitted. "I've taken a lot of stick. And rightly so. The performances have not been good enough." But, having ensured a third straight season back in English football's third tier, Davis admits that it is an achievement just being at that level. "We've overachieved for many years," he said. "Because of the restrictions on finances, to be in a league like this is over achievement. "Dario Gradi before me did it for many years, overachieving in the Championship. And everyone knows how much we rely on our academy to keep the club in business and bring though young players. "How many years we can do that for I don't know, In the end, it can catch up with you and you can suffer relegation, depending on the group of players we have. "But I'd love to keep doing it. For us to stay in this division, to play the likes of Preston and Bristol City, and Barnsley now that they've come down, is a challenge I look forward to each year."